Presented November 15, 1995, for grade II lameness in the left hind leg. History: Cy was in light work only, and there was no history of trauma. The owner felt the lameness could have been present in a milder form for some time. 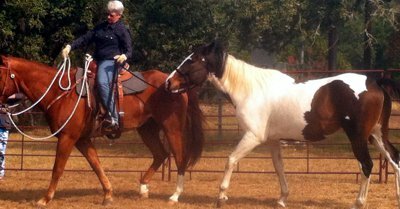 Cy was a retired three-day event horse used for riding lessons. At the time of presentation, Cy could not be worked at all during the summer due to anhydrosis. he was also prone to colic when stressed. Cy presented with a grade II lameness of the left hind leg. Palpation of the leg did not reveal pain, swelling or heat. Cy did not react to examination of his foot with a hoof tester. Flexion of the leg increased the lameness to grade III. The lack of palpable findings and reaction to flexion of the leg would suggest early degenerative arthritis of the distal intertarsal or tarsometatarsal joint. However, the owner declined nerve blocks and radiographs to confirm the diagnosis. After radiographic confirmation, options would include non-steroidal anti-inflammatory agents and/or intramuscular glycosaminoglycan injections. This approach has varied rates of success, depending on the state of degeneration when treatment begins. Cy also had a history of anhydrosis and colic. Western medicine has no confirmed explanation or medical treatment for anhydrosis, but hypothyroidism, hypochloremia, increased blood epinephrine concentrations and exhaustion of the sweat glands have been proposed as root causes. The cause of equine colic is often difficult to determine but it is often related to feeding and management practices. Symptoms of lameness were first encountered as the weather began to turn cold. Moderately severe pain with flexion of the leg was noted. There were no obvious signs of heat on palpation. Painful Bi Syndrome was the likely cause of the lameness. Painful Bi Syndrome is the result of an underlying Wei Qi deficiency. The Wei Qi is responsible for circulating superficially and protecting the body from external influences. When it is weak, pathogenic factors can invade at a deeper level of the Meridians, muscles, channels, collaterals, and joints. The results in stagnation of Qi and blood, creating Bi Syndrome. In Painful Bi Syndrome, the invasion is by Cold. Symptoms will tend to be worse in cold weather. Cy had a history of anydrosis during the summer months, and mild indigestion-type colic whenever stressed. Cy was not experiencing colic or anhydrosis at the time of the examination, so diagnosis was based on physical appearance, palpation and history. Cy's coat was in good condition but he was thin despite receiving several gallons of grain daily. Cy's thin condition and frequent digestive disturbance suggested chronic Spleen Qi Deficiency. The anhydrosis in this case was due to a combination of summer heat causing damage to Qi and pathogenic cold due to exposure to cold water after sweating. The owner stated she often bathed Cy in cool water when he was sweating. Cold may cause closing of pores with manifestations of chills and anhydrosis. The following Acupuncture points were used for treatment: Baihui, BL 10 on the right, BL 20, LU 7, ST 36, and SP 6 bilaterally. All points were treated once a week for four weeks. Moxa was used on the Baihui needle each time to dispel Cold. Cy was presented for a mild hind limb lameness. However, further evaluation of the case uncovered several more serious problems: anhydrosis and colic. A western approach to the lameness would have involved additional diagnostics to localize the lameness. Another option would have been to give a series of intramuscular glycosaminoglycan injections and monitor response. Both of these options were declined by the owner. Diet and management changes can be useful in the prevention of colic and appeared to be beneficial in this case. Western medicine does not currently offer a reliable treatment for anhydrosis other than moving the individual to a cooler climate or providing an air-conditioned stall. After discussion of all the options, it was decided acupuncture treatment offered the best chance of success. Acupuncture points were chosen to address the underlying imbalances. The Painful Bi Syndrome was addressed by selecting points Baihui, LU 7 and ST 36 to strengthen Wei Qi and expel Cold. The colic was addressed by selecting points BL 20, ST 36 and SP6 to tonify Spleen and Stomach Qi, and by adjusting the diet. Equine SeniorT was chosen to feed because of its digestibility and high fiber content. FastrackT contains beneficial bacteria and yeast cultures that aid in digestion. The anhydrosis was addressed by selecting points ST 36 and LU 7 to increase the circulation of Wei Qi and open the pores to cause sweating. Promoting circulation of Wei Qi increased Cy's resistance to summer heat which could damage Qi, and to Cold, which could cause the pores to close, leading to anhydrosis. The lameness, colic and anhydrosis resolved following treatment. Cy has also gained weight and is maintaining on less feed.